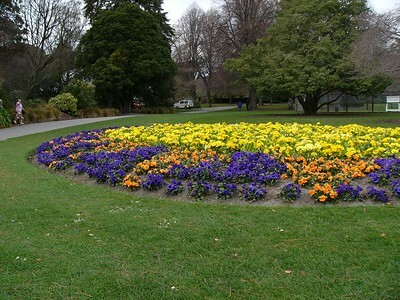 Springtime in New Zealand! Unless otherwise specified, these photographs were taken with a Panasonic DMC-FZ10 by David Fong during a week-long holiday September 2004. Still plenty of snow, and just a few flowers were starting to bloom. 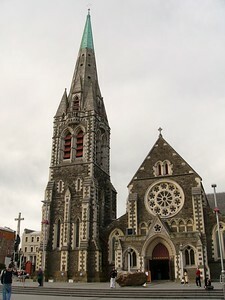 Christchurch has been compared to an English town. The river in the photo is the Avon. 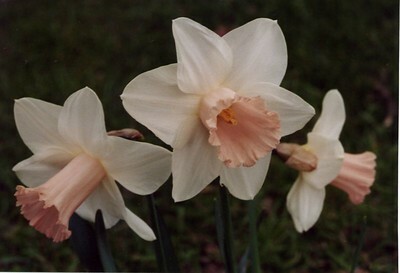 Christchurch is well known for its fields of daffodils. This photograph was taken by Stephen Fong with a Sigma SA-300N. 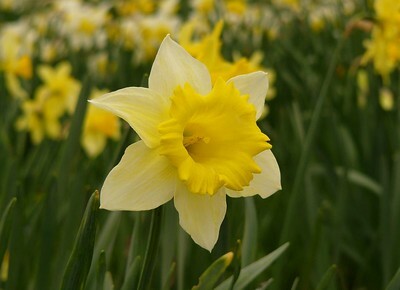 Christchurch is well known for its fields of daffodils. This photograph taken with a Panasonic DMC FZ-10. 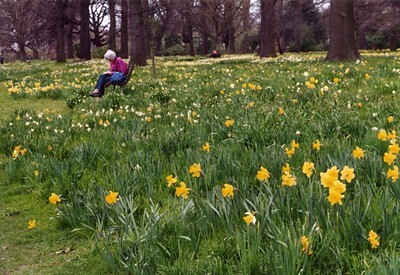 More daffodils in Christchurch. This photograph was taken by Stephen Fong with a Sigma SA-300N (35mm SLR). We were lucky enough to be visiting New Zealand south island in early spring (September). Not only were the flowers just springing to life, but there was plenty of ski-able snow on the mountains. 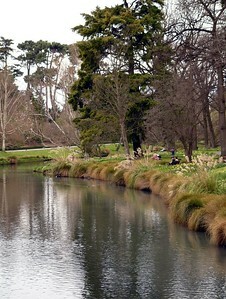 Christchurch is the biggest city on New Zealand's south island. 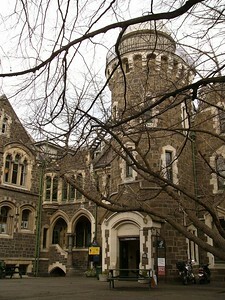 The observatory is on the grounds of the old Christchurch university. It is now an enclave for the arts. 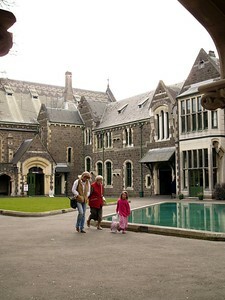 Used to be the Christchurch university, it is now an artist enclave/(?faculty of the arts). Some artists are 'on display' to show their craft skills live. The enclave is also home to a fudge shop. 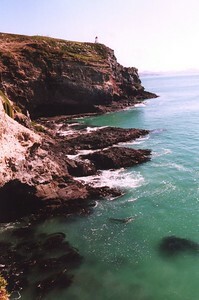 Dunedin coastline, close to albatross colony. Picture taken with Sigma SA-300N (35mm SLR) by Dr. Stephen Fong. Albatross colony centre at Dunedin. This image has been 'stitched' from several different photographs taken, hand-held, with a Panasonic DMC FZ-10. I used hugin/Panorama Tools/autopano-sift to stitch the photographs. The image was then cropped, colour corrected and judiciously smudged with the GIMP. This is my first attempt at stitching together a panorama. 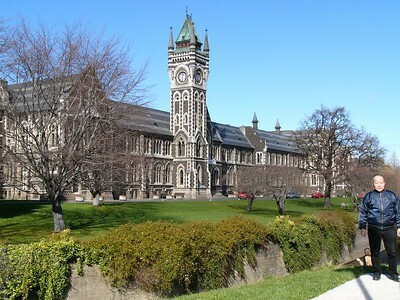 Dad and Mum studied at Dunedin university (the University of Otago). 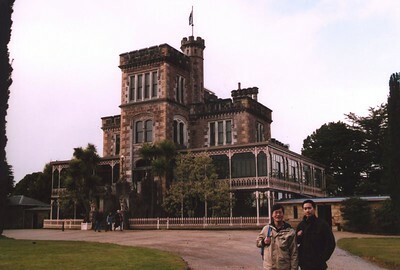 Lanarch Castle, close to Dunedin. Actually a mansion, of course! The original owner made his money from banking. Picture taken by Dr. Stephen Fong, with a Sigma SA-300N (35mm SLR). 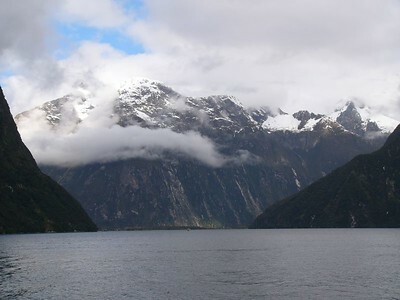 Milford Sound is actually a fjord, cut out by ancient glaciers. 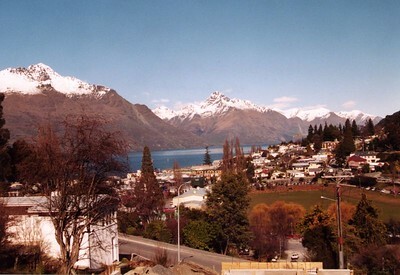 It is a day-trip from Queenstown by bus. The 'Milford track' is a popular walking track which takes several days (I think) to complete. Mountain reflection. One of the bus stops on the way from Queenstown to Milford Sound. 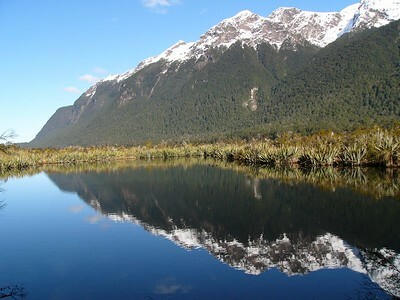 The "Lord of the Rings" was filmed in New Zealand, mostly on the South Island around Queenstown, as far as I can gather. 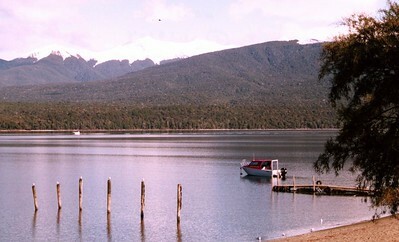 It is possible to go on "Lord of the Rings" horseback and boat rides to visit film set locations. The director, Peter Jackson, is now a New Zealand national hero. 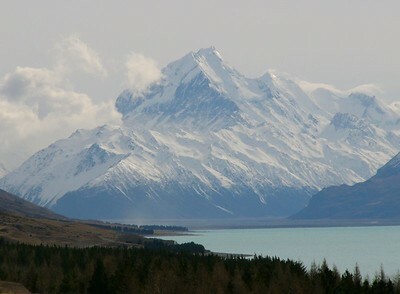 Mount Cook is New Zealand's tallest mountain. 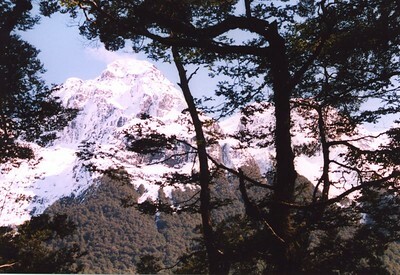 Edmund Hillary (of Everest fame) cut his teeth on these mountains. Cable car servicing the hill close to Queenstown. That bungee-jump platform in the top-right of the picture features in the 'Berocca' advertisement. PIcture taken from our hotel room. We stayed at Cranbury Court (www.cranbury.co.nz), which was a pretty nice place to stay! 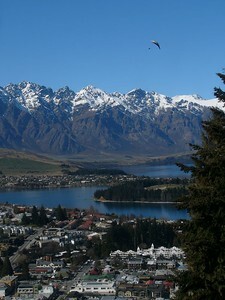 Queenstown is perhaps the premier tourist destination of New Zealand south island, if not New Zealand itself. There is plenty of 'adventure' tourism, such as bungee-jumping, horse-riding, white-water rides and various parachuting/para-gliding. The parachute in the picture is a tandem-jump from the same hill from which this picture was taken. 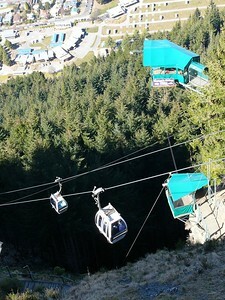 This picture is taken from a cable-car servicing the hill. A lake on the road from Queenstown to Milford Sound. 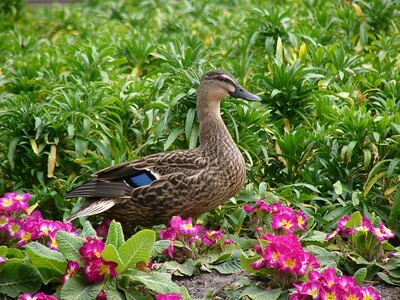 Photograph taken by Stephen Fong using a Sigma SA-300N. Mountains on the road from Queenstown to Milford Sound. Photograph taken by Stephen Fong using a Sigma SA-300N. 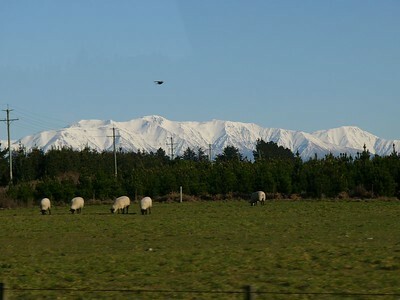 New Zealand is well known for its many sheep. We travelled around New Zealand using the InterCity buses and Newman's buses. Although they are transport buses, the drivers give a running and non-intrusive commentary on any points of interest. Between Christchurch and Dunedin. 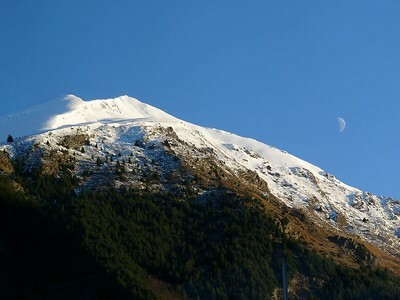 Picture taken through a window from a moving bus. 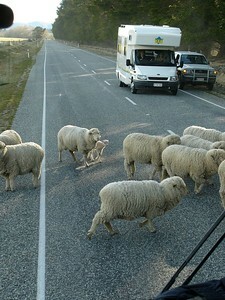 Australians like to joke about New Zealanders and sheep. New Zealands from the North Island like to joke about the relationship between South Islanders and their sheep ('where the men are men, and the sheep are nervous'). In fact, sheep outnumber humans in both New Zealand and Australia.